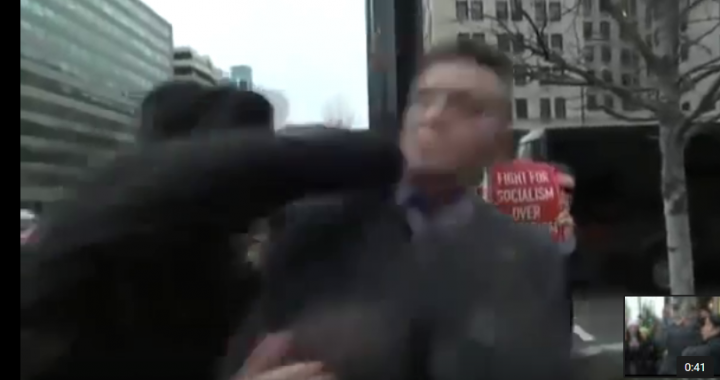 Richard Spencer punch to the music of Born in the USA. Peoples Inauguration Friday night in Boston. Womens march Saturday in Boston over 175,000 people. Davos — themes, new tech and rise of robots, globalization and retreat of globalization. Typically not supportive of right wing. They are realizing that the anti union perspective is bad for them. View of what to expect under trump. Refinery Town book review, about forming Progressive Alliance to win locally and building an alternative to the two parties. ACLU: massachusetts membe Kade Crockford spoke and highlighted the importance of secure communication and informed peopel to use Signal. Emphasis on calling elected officials and getting them to hear us, we have a tendency to not take action. FBI can hack without a warrent and the concerns it puts forward. Tech for Liberty project. Local organizing to hold police accountable Seecops legislation. Lots of focus on local actions. National Domestic Workers Alliance: Spoke about the challenges the immigrant communities have faced and their need to begin to use better technology and communication but also shared knowing the fear many newly active people are seeing. Need to work on making sanctuary companies, in contracts and pushing company leaders. Need tech support with worker centers and working on expanding the security and privacy knowledge. MIRA (Massachusetts Immigrant and Refugee Advocates Coalition) spoke about the local push for supporting free legal assistance and municipal IDs for undocumented folks who cannot get state IDs. Labor Lawyer Spoke about the difficulty in organizing tech workers. Spoke about the ways in the US that companies use captive audience meetings to control thoughts on forming a union. But that now is the time to organize to protect our work but more importantly to protect the data that many of the tech workers present work on. The need to eliminate that data from being a tool or threat against us all. Others can follow to find out more info from their twitter. Also the NeverAgain Tech pledge. Turkey is starting to ban strikes. Davos industry 4.0 tthe big things is if contract worker are recognized as employees. Posted in Podcast, Uncategorized and tagged ACLU, Alternative Globalization, Anti-Globalization, boston, Davos, Domestic Workers, Elections, Fundamental Rights, Immigrants, labor, Labor Lawyer, labornotes, LeftRoots, Marching, Massachusetts, Municipal IDs, NeverAgain, NLRA, NLRB, Organizing, Progressive Alliance, Refinery Town, Refugees, Richard Spencer, right to work, RPA, Security, Signal, Tech Pledge, Tech Solidarity, Trump, Turkey, Union.